The core for celebrating Labor Day is paying tribute to the men and women in the workforce that has brought upon strength, prosperity, and the well-being to a country. But Labor Day also means the last long weekend before school starts. Expect a weekend of picnics, barbecues, and a parade to revel in the event. In our list down below, we have gathered a heap of Labor Day party flyers. Invite guests and potential revelers by handing out and plastering Labor Day flyers on the streets and through the online media vehicle. You may also go through our list of Labor Day banners. 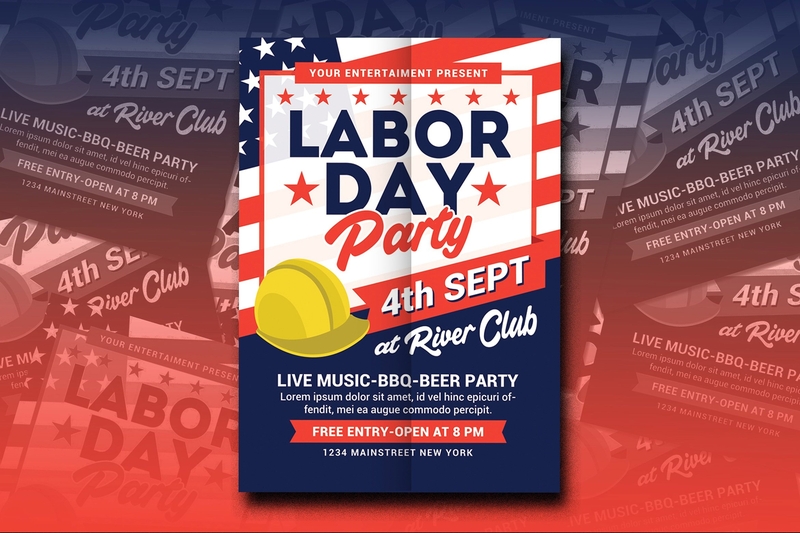 In our list of extensive selection for Labor Day party flyers, we promise you that the examples are easily customizable according to your design preference and agenda. If you happen to have troubles in editing or crafting a flyer, you may freely skim through our guide to designing flyers. Let it take you to the technical and design processes involved and inspire your creative eye with a couple of design examples. A party wouldn’t set off without a pop of confetti and fireworks. Well, in this case, those party essentials are what completed the whole design aspect of this celebratory Labor Day flyer. The design is treated with an organized layout for the technical elements such as event name and details, call to action, and so on. That way, it gives space for the design elements into appropriate placement. 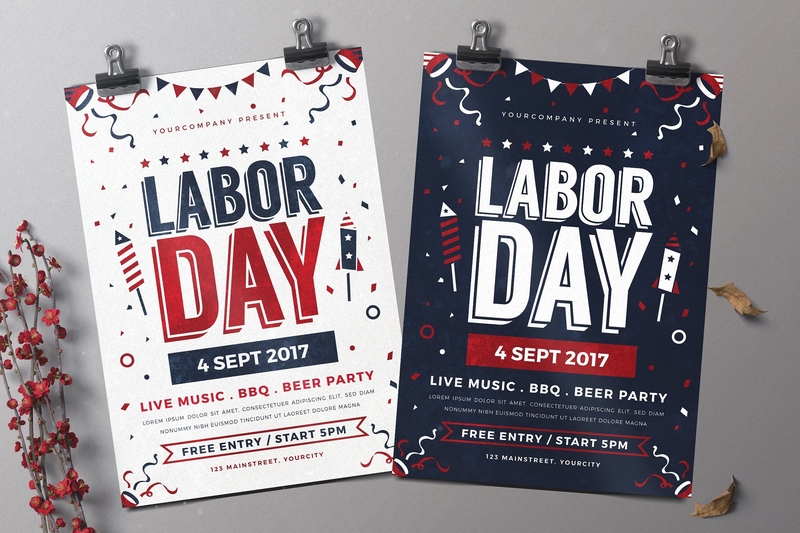 This set of Labor Day flyer has two color variations for more options. You may edit the text and is saved in a CMYK color mode to retain the colors you see on your screen once handed out on physical print. 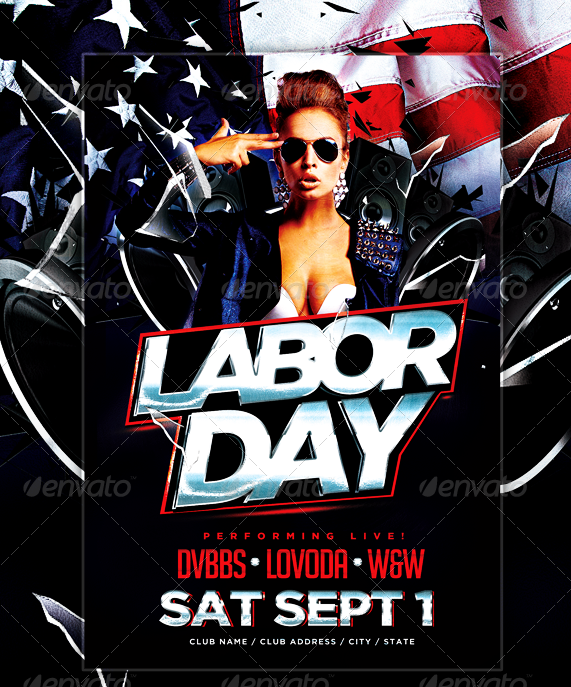 The Labor Day PSD Flyer Template best represents the American Patriotism from top to bottom. With its customization offer, this flyer could be of various themes beyond the celebratory event of Labor Day. Easy to use flyer template with an editable PSD file. Inside the latter is an organized layers and color layer structure. 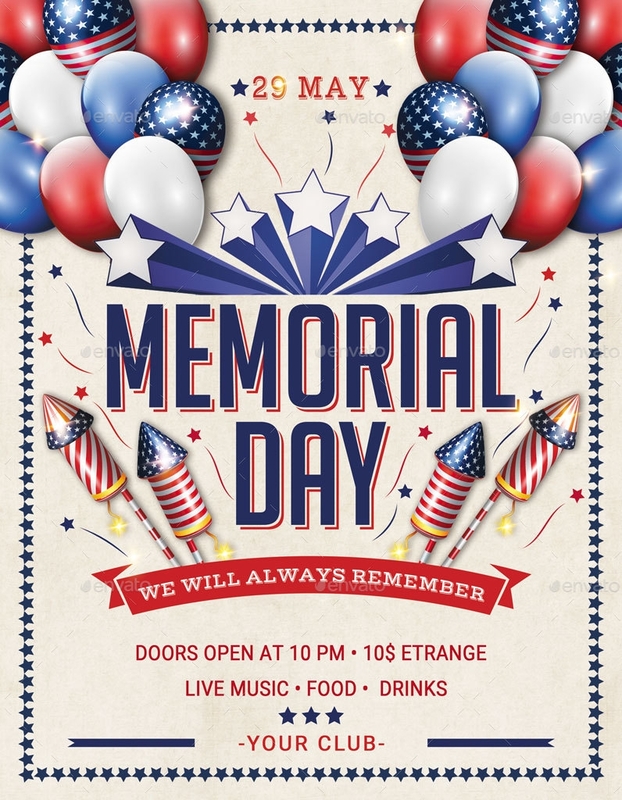 You may freely edit the text, color, and image of this specific flyer design. If you want a more simple and subdued party flyer design, this specific flyer offers just that. It still incorporates the all-American and Labor Day elements but with a simple and organized type of layout, which allows viewers to scan through the event details minus any busy backgrounds. Set in an A4 size with bleeds, you may freely edit the flyer’s text, font, and its colors with its organized layers. Two words: explosive and festive. This specific flyer best represents an all-American Labor Day celebration that brings about excitement and pride. The design occupies a dominant use of imagery that is separated well in terms of layout. This is to give way for viewers to have a clear grasp on the rest of the event details. This set offers two design variations for the said occasion as well as for the 4th of July event. To ensure a high quality print, this specific flyer is set with a high-resolution file format of 300dpi and is CMYK print ready. For Labor Day, expect a lot of food and music parties and picnics to pop up over the celebratory weekend. 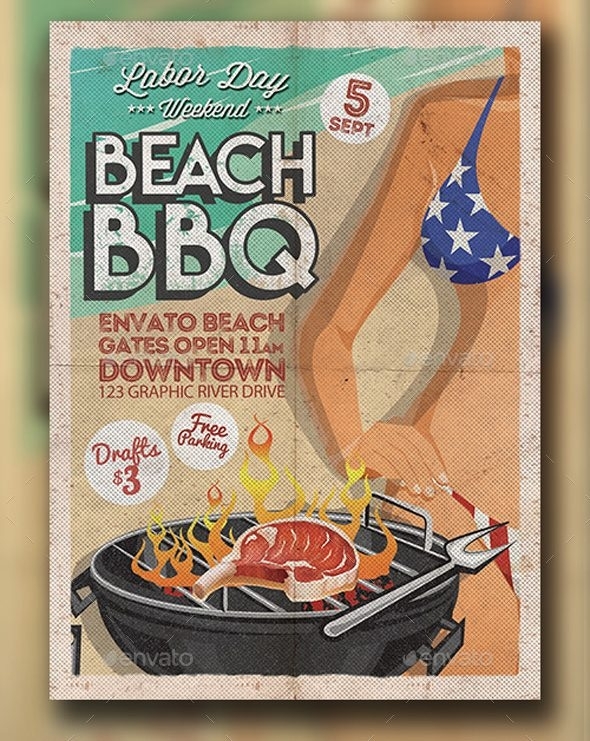 If you are planning on organizing one for yourself, the Labor Day BBQ Flyer Template would be a perfect selection. The design itself is direct given that it has been showcased through illustration. The text is set in a bold type and larger font size. This specific flyer can be quickly customized and is set with organized layers. If you want to take the family outing on a wider reach, setting up a grill and cookout is an idea very well appreciated by guests and potential revelers. Plaster on the streets or blast on the social media vehicle through the use of this very specific flyer. It best illustrates the event and distributes the technical elements to create an organized design composition. 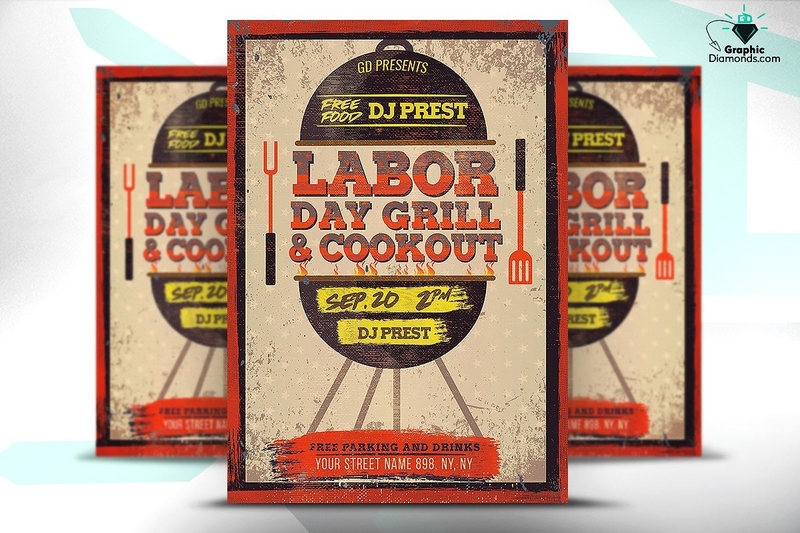 The Labor Day Grill & Cookout Flyer is easy to customize with its organized layers and color layer structure. You may edit the text to match with your agenda. It is set with a 300dpi file for a high-quality print and Web use. 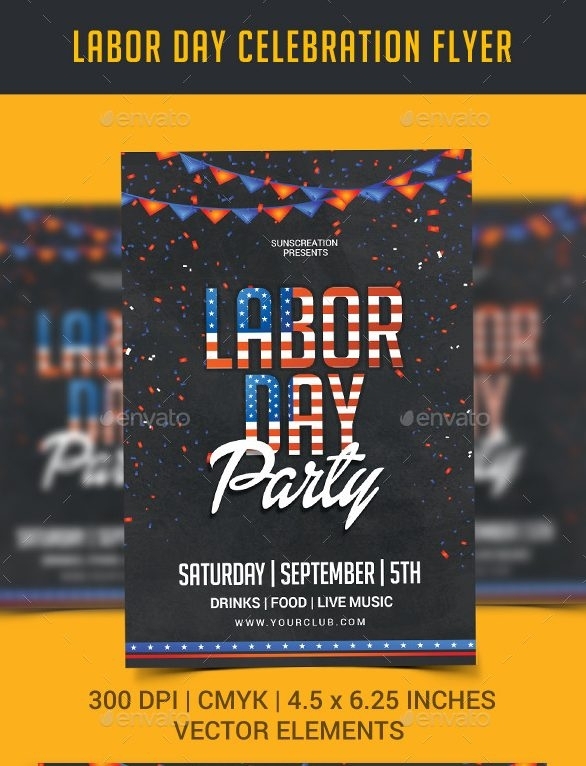 If you want to keep things a bit minimal, the Labor Day Celebration Party Flyer Template is a design to consider using. This flyer incorporates a big type layout, hence, the minimal use of imagery and design. This flyer template comes along with a scalable file that still provides a high-quality design once zoomed in. You may freely edit the text accordingly and to note that all fonts used are of free service. This specific flyer is set in a CMYK color mode to which it is ready to print. Utilizing an iconic feminist imagery demonstrates the strength and prosperity brought upon the men and women in the workforce. Aside from the main subject of the design, the latter still represents the American culture with the use of the flag as an overlay. This flyer template is saved on an A5 size, a bit smaller in size but still can be of a practical choice. If you want a clear and direct flyer design, then don’t think twice about downloading such specific flyer. It is designed to have a grunge effect given by its textures generously applied on the design. The latter has placed most of the essentials such as call to action, event details, and so on. You are free to add some adjustments and tweaking however you wish. It is set in a print-ready format as well as with organized layers. You wouldn’t have to worry about the fonts used in the design since the links are attached with the main file. 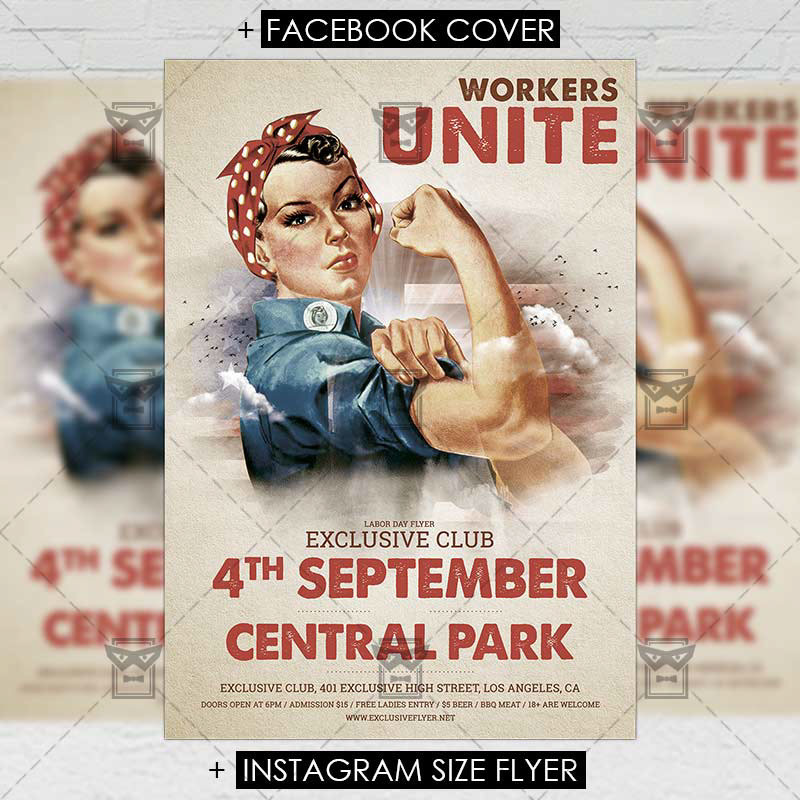 Invite guests and revelers to upcoming parties and events through this bold and direct Labor Day flyer. Whether it be for underground or mainstream events, this flyer design will be of great use giving reach and frequency to the target audience. To ensure you that the final print would be of high quality, this flyer design is set in a 300dpi format perfect for small and outdoor print. Also, to note that this specific flyer is set on CMYK color mode, so you’ll know that the colors you see on physical print will be exactly the way it is on screen. 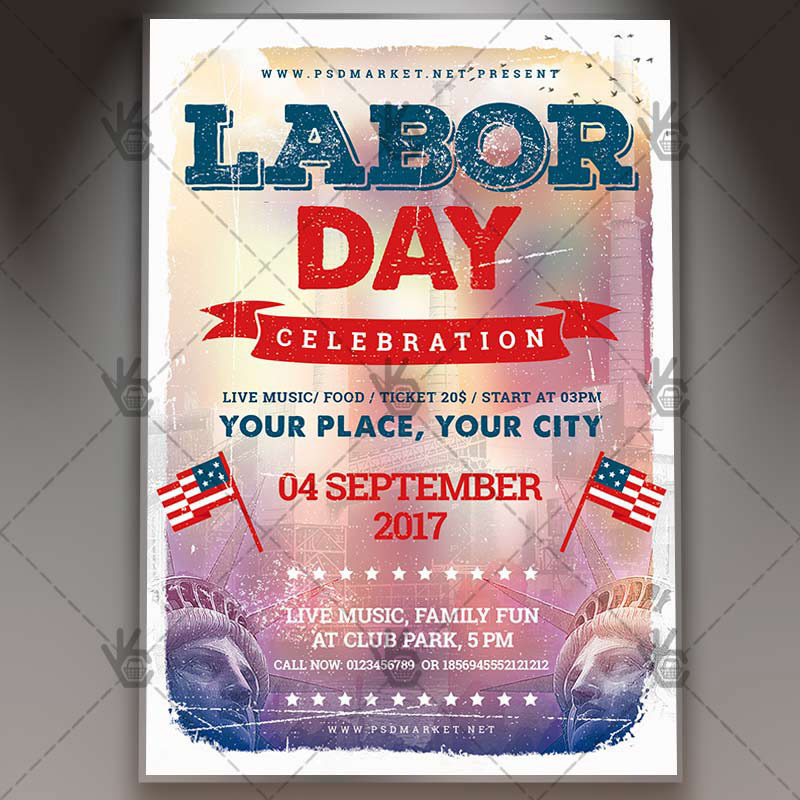 For a more extensive selection on Labor Day designs, you may freely download from our heap of Labor Day labels. Perfect for design projects, advertising collateral, and promotional materials.